Seven Night Minimum NO EXCEPTIONS. Maximum Occupancy: 6 (NO MATTER THE AGE) This is a regulation set up by The City of Marathon that states 2 persons per bedroom plus 2. NO EXCEPTIONS. Beautifully decorated stilted condominium unit at Gulfpointe. Located right in Marathon, the heart of the Florida Keys! This condo features 2 bedrooms and 2.5 bathrooms. The Master bedroom has a king bed that has peekaboo views of the gulf and an en suite bathroom with a double sink! The guest bedroom has one queen and one full bed. The guest bathroom features a shower/tub combo. The half bath is located right off the kitchen. The first level of the condo will feature the kitchen & living room with peekaboo views of the gulf as well as views of the shared pool. The bedrooms and other bathrooms are located on the second level of this unit. There is a pull out sofa in the living room. Amenities: Gas grill, internet. Dockage available on first come, first served basis. There is a tag in the unit that you will put at the dock to reserve your slip for the length of your stay. Boat ramp nearby. 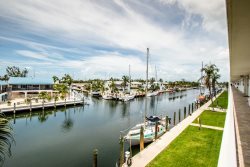 Located near Vaca Cut for easy Gulf and ocean access. Enjoy the peaceful setting of this quiet community! ****MINI LOBSTER SEASON MUST BE A 28 DAY MINIMUM. NO PETS ALLOWED PER CONDO ASSOCIATION RULES. Vacation Rentals of the Florida Keys LLC.